It will take at least a month to get an accurate idea of what you're spending on non-essentials. It's worthwhile putting the time and effort in to do it though because it will give you real figures to work with instead of guessing it and being wrong. When you're dealing with your money, you need to work with reliable figures. And for that reason, I encourage you to be truthful, no matter what that truth is. You also have to be thoughtful and kind. If you're doing this exercise with your partner and one or both of you have been overspending, blaming each other does no one any good. Start your budgeting in a positive frame of mind, agree that there will be no blame, you're doing something about your financial situation and that's the important thing. Now you're ready to take control of your finances and you do that by creating your own budget. To create a budget, you have to know all your annual expenses. If you have access to last year's bills you're in a good position. You need to know how much you spend on internet, phones, TV, electricity, water, rates, rent/mortgage, insurance, health, education, clothes, food, petrol, entertainment, pets, gardening and anything else you pay for during the year - either once or many times. what you pay for services like insurance, phone, electricity etc. items you pay for in cash - groceries, petrol etc. When you make up your lists, you'll need to work out how much you spend every year on each of these items, then divide that amount by 12 to give you a monthly figure to put aside. You don't have to have a monthly budget, set your up according to how you are paid. If it's monthly, do a monthly budget. If it's fortnightly, do up a fortnightly budget - for this you'd add up your yearly expenses and divide them by 26, because you'll be paid 26 times a year. If you get paid weekly, divide your yearly amounts by 52. Now, why did you track your spending? 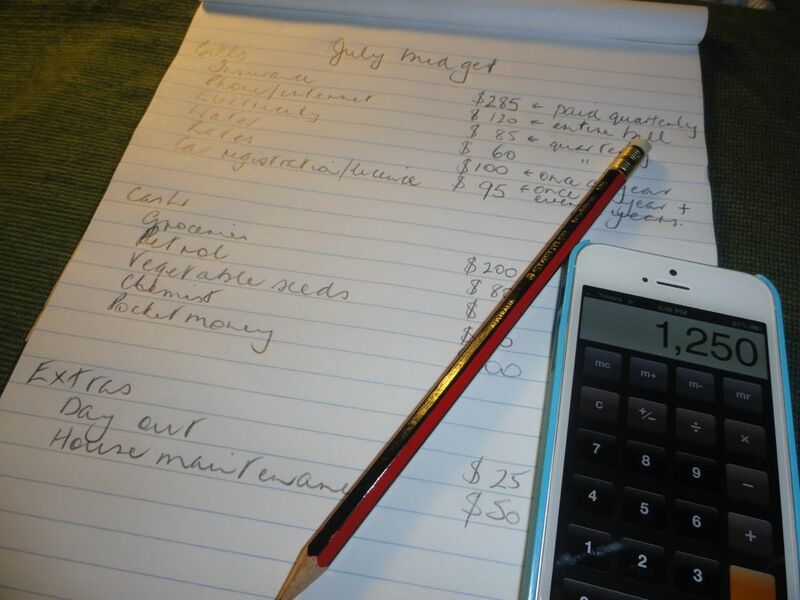 When you write out your budget you may find you don't have enough money to cover your expenses. If that happens, go to your tracking records and see what you spent on non-essential spending. Hopefully, that will cover your budget short fall. If it doesn't you'll have to reduce what you're spending in other areas so you can live within your means. Look at items such as groceries - maybe you can cut ten dollars from that. Look at phone bills. Do you need an expensive phone? Do you need a phone at all? Look at entertainment, you may have to cut down on that until you get your budget sorted out. For example - your list may be similar to this or different. Insurance - health, car, home, life. Set up your bank accounts to facilitate your bill paying and to earn the highest amount of interest. You can pay your bills using a credit card (paying it off each month to avoid interest payments), debit card, cheque or direct debit and if you have enough money in the bank in your bill paying account, this will work well for you. We have a bill paying account that our pensions go into - yours could receive your pay. This is the account you use to pay your bills as they come in. You leave enough money in this account to pay the bills you know you'll have to pay this month as well as the bills you've budgeted for but aren't due this month. What is left is transferred to a higher interest account. We have a higher interest ING account and the money that doesn't have to cover bills is transferred to that account. We get better interest in this account and we can also withdraw cash for our monthly cash needs such as groceries. We also withdraw money from here to pay in cash for any of our extras - haircuts, house maintenance etc. When cash is withdrawn from the bank, ours is put into envelopes/jars/ziplock bags under their budget categories - groceries, petrol, garden supplies etc., so I know exactly how much I have to spend in each category. When I go shopping, I take money from these envelopes, do my shopping, and return any change to the envelopes. During the month, I can see the money dwindling and I know exactly how much a I have left to spend. Whatever is left in the envelopes at the end of the money can be added to our savings. It will take you a few months to have this system rolling along effortlessly but when it does, it works very well. Tthe first thing is to get those lists happening. There is plenty for you to get started on. Remember, be truthful, be kind if you're doing this with your partner and make sure you include everything. This isn't easy but if you work out a budget you can live on, your life will be easier because you took the time to do it. Good luck! Another great post full of useful advice. We have done this exercise in the past and included as a separate section Gifts/presents/Christmas; This is a year round expense and it is a valuable exercise to decide how much you want to spend on presents. Wonderful post Rhonda, thanks for sharing your budget tips!! Would you believe at 40 I'm just starting to seriously do a budget, I'm finding it an eye opener to say the least. Good advice. I receive some strange looks when shopping as I not only have my list but I'm writing prices down the side so if I have some extra dollars at the end, and there are sales on somewhere around town, I'll have a look for birthday/Christmas presents. I love the fact that a lot of stores around here will do laybuy too, even on some sales. Saves fuel too as I try to go into town only twice a month as it's a bit of a drive. When we first started budgeting we used the envelope system. We allocated the right amount of money for each bill/category each week. This worked well for us. The bank weren't too impressed though, when each fortnight I walked in and asked for so many $50 notes, so many $20 notes etc right down to $1 coins. But that was their problem. They did it and it worked for us. Since moved on to spreadsheets and budgeting program on the computer. Hi - I was wondering about birthdays and Christmas? I guess you're talking about gift giving at these times. If that's important to you, you'll have to budget for them. Add an extra category for gifts and put aside money each month for them. I like seeing your hand-writing. I love all the budgeting stuff and have since I was about 30 recorded all my spendings in categories and had envelopes with my cash. I also factor in family birthday presents (our limit is $20 normally and $50 when one of us turns 50) and also factor in the christmas presents same deal $20 x number of immediate family members. I also factor in presents for kids parties (my kids are 9 and 7 and do get invited to birthday parties) so I have to factor in gifts for that and I try and do my best to get something under $20 - it used to be $15 but it's hard to buy a toy/present for $15. I do try my best sometimes I succeed and other times it's the full $20. Also depends upon when you have to renew your drivers licence as well these are costly upwards of $100 or so depending upon whether you get a 3 year or 5 year one and if you have 2 drivers in the family that could be $200-$300 you may need to factor in. I also have to cater for school books and school clothes, shoes etc. my kids go through 2 pairs of school shoes a year (this year it will be 3 because they are growing so fast and also they wear through them) so these all have to be factored in the budget. The books for the two of them $400 and we aren't even into computers and big text books yet. The govt is now helping with this however it still needs to be in the budget because you have to buy it straight away. If you have any magazine subscriptions, journals etc. All of these can be borrowed free from the library however I do like to give myself the gardening magazine subscription because it's a feel good and I don't drink or smoke. I think if you have a partner who may love drinks after work or the like this is where 2 hrs on a Friday night can blow the whole month's budget. What I used to do when I was married was to invite friends around for a bbq on a friday night and a carton of beer for $45 verses is way better than $45 for one round of drinks and a $45 cab fare. (him not me that is). So my point is, while budgeting is about cutting back you can still have Friday night drinks and enjoy it at home rather than wasting a whole lot of money going out to the pub. Thanks so much for this post! I've been wanting to do a budget for some time, but just haven't known where to start. I might sit down and have a go tomorrow night. thanks for another wonderful post. I need to put in some effort with checking I'm getting the best deal on insurances etc...I don't know why, but I'd rather scrub the loo than spend hours on the phone/net comparing prices! But it's important, and it's now 'on the list'! Like some of the commenters above, my husband and I have always budgeted for (small) gifts to family and friends for birthdays and Christmas, plus giving to charity. By allocating money in the budget one is not tempted to say 'I can't afford to give'. Budgeting was particularly essential for us in the years when my husband was paid just four times a year! And the spin-off has been having children who could see with their own eyes, written down, the evidence that the money was finite and would not stretch to a pair of luxury trainers, no matter how many of their friends had them! Now adults, they too are reaping the benefits of knowing how to budget. Dear Rhonda, thank you so much for this posting. I do have an envelope system for keeping my receipts and have been filling them. Slow to keep up with all the receipts I have neglected to stay on top of things. To my horror I've discovered I'm spending way too much on groceries and the charity shops. This article has pulled me in line again and I realize how important it is to stay on top of this for it to work. I think your jar system sounds like a good idea, where your able to actually see the money. p.s. Hope Hanno is feeling better. Hi Rhonda,I've loved your posts recently and although I always considered myself to be good with money I never really took the time to track how money much I exactly spend on what each month. For the month of July I have started this process and I'm interested to see how it goes. One question I do have for you though is how much do you think the weekly shop should be for the average family of 4? I budget $150 but always come under, usually by about $20-30. That includes all meals (breakfast, lunch and dinner) for the 4 of us. We do have one 'takeaway' night per week but that comes from our 'spending' money for the week. Lou, there is no answer to that question because there are so many variables. It would depend on what country you live in, if you're vegetarian or vegan, if you produce food in your own backyard, if you stockpile, if you make your own cleaners, if you eat organic, or seasonal, or local. The most important thing that I have done to make budgeting easier is to save up (and it took a long time and hard work and extra scrimping) a whole month worth of expenses (and this included everything. Wekeep this in our chequing account. Thus, at the beginning of the month we have all the money sitting, ready and waiting for our use for all the expenses of that month. The money we earn during this month is for next month. I can pay all the bills anytime I want and never have to worry about being late or late fees. We don't earn any interest on this money but there is no savings account that pays enough interest that could make up for even one late payment fee. This makes sticking to our budget easy because it gives us time to plan and react. If a prescription drug cost more than the money we have budgeted for this category then next month we cut back on something else so that we are always in balance. I keep our cash in zip lock bags and at the end of the month any left over goes into a canning jar. This is left to accumulate and then it is available as an extra for whatever we need. There are always going to be times when the budget does not match the expense.